Church Hill Farm07771 932957work Self-cateringPerched on the edge of the hill with beautiful views across the Wye Valley to the Forest of Dean, sits the very private Church Hill Farm. Hidden away, over half a mile from the nearest road, the property is surrounded by its own land and overlooks the picturesque 11th Century Penallt Old Church. Behind the house ancient woodland provides a perfect backdrop. Deer, badger, foxes, and rabbits roam throughout the property, and the sounds of songbirds fill the air in spring. Buzzards soar in the air above the hill, and at dusk, if you listen carefully, you will hear the sound of bats chattering as they wake up for their evening foray into the air to catch insects. This is the setting for what is a very comfortable holiday rental farmhouse which is fitted with all modern conveniences and is the perfect base for exploring the area. Just five miles from Monmouth, the location offers a hugh variety of different options for the perfect holiday break. The Lower Wye Valley, an area of outstanding natural beauty, is literally on your doorstep. If you like walking, you can leave your car at home and explore the local area on foot. Or within fifteen minutes you can drive to any one of a number of specially worked out circular or longer distance walks. En route you will see spectacular views, ancient buildings, old churches, miles of old stone walls, and peek into the gardens of the pretty cottages that are dotted throughout the countryside. The town of Monmouth itself sits at the mouth of the Monnow where it meets the Wye. It is a picturesque and interesting place with a number of sites well worth a visit including the famous covered bridge, the castle, St Mary's Church, Agincourt Square and an attractive main street with a good selection of shops and a market in the square on Fridays and Saturdays. There is a good leisure centre and swimming pool, two excellent golf courses and canoe and cycle hire centres. Nearby are any number of interesting castles - Raglan, Whitecastle, Goodrich, Chepstow and Caldicot castles, and the very famous Tintern Abbey. Slightly further afield (12 miles) lies Abergavenny and beyond Hay on Wye. The back road from Llanvihangel Crucorney, home of the oldest pub in Wales, The Skirrid Inn, to Hay on Wye, is one of the most lovely rides in the country. The single track road winds slowly up the Black Mountains past the spectacular ruins of Llanthony Priory, through Capel-y-Ffin up to the top of Hay bluff. The view from the top of the bluff offers a 360 degree perspective for miles across three counties and is one of the most exhilarating in Wales. When the weather conditions are right you can watch the paragilders literally throwing themselves off the bluff to circle the hill or soar away across the countryside when air currents permit. At nearby Crickhowell there are a number of paragliding schools where the adventurous can learn to fly. To the east is the fascinating Forest of Dean. This is the largest forest in England and offers some beautiful walks and cycle trails as well as being steeped in history. 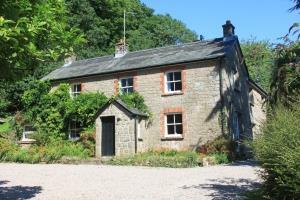 Despite its seclusion, Church Hill Farm is just an hour from the major cities of Cardiff, Bristol and Newport. It is just an hour and a quarter from Bath and Cheltenham. Totally private location at the end of its own drive Stabling and grazing for horses by arrangement Children welcome from any age. Directions with booking or see our website. The nearest train station is Newport and from there you can take a taxi. To enjoy the property a car is pretty much essential. The nearest airports are Cardiff, Bristol and Birmingham.